One of the nicest Bagua Animal forms ever. You will feel the benefits both to your fighting skill s as well as to you own wellbeing and positive mind state. 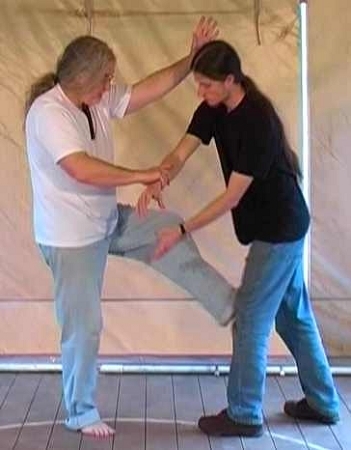 Combine this with the Bagua linear form and you will be flying for the rest of the day. it is just such a positive set of movements, it just makes one feel great! It works upon the Gall Bladder, Colon and Pancreas in the body and as the Gall Bladder meridian is the longest, covering the body from head to toe, the whole body is toned up when you practice this form. The Unicorn is of the clouds and earth, he turns like a tornado and the organs affected are the whole right side of the abdomen including Gall Bladder, Colon and Pancreas. He is regal and powerful attacking with front hooves as well as rear. The Unicorn's family member is the 'Mother'.